What a great concept. How would you like to Create Change? Here's how I would like to create change. Every year, I get mailings from the Susan G. Komen 3 Day for the Cure. Every year I say I'm going to go and I never do it. But, this year is the year that I've finally decided to do it! 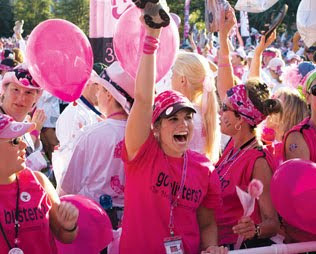 Susan G. Komen's 3 Day for the Cure is coming to Philadelphia this year - about an hour and a half from where I live. The walk is from 15-17 October. See that up there? The above photo embodies it all - the feeling of overcoming something, the feeling of creating change, the feeling of helping with something bigger than yourself, the feeling of I DID IT! Breast Cancer has not hit my family (thank God!) but I am adopted and even though I found my birth family, we're not too close and I'm not 100% sure if there truly is Breast Cancer in our family. Alternatively, I am a 9 year cancer survivor. I discovered I had cervical cancer when I was 23 years old. It was Stage 3 and I was SCARED. I'm lucky it was found when it was. Cancer has always been close to me, even before that - when I was 7 I had a lump removed from my right arm. I still have the scar. I worry about cancer the most because of these two instances. That's why even though there is no Breast Cancer in my history, I want to take this walk to help make a change. I'm blogging about Creating Change this year to try to win an HP Mini 311 Notebook PC and an HP Touchsmart Premium Printer bundle. We were asked to write about "What are you or will you be doing in 2010 to create change and how will winning this technology bundle help your efforts?" In addition to me FINALLY doing the 3 day Breast Cancer walk this year, winning this bundle would help me chronicle my trip there, my 3 day walk, via my blog, Twitter, and Facebook. Hopefully I could use it to get people to donate to this great cause! Man, you have an interesting life. You _really_ should write a book. Good luck...hope you win the printer/PC combo, esp. with all the computer problems you've written about lately! And good luck with the walk, too. I've also wanted to do the Komen walk, just never have had the stars align to do it.